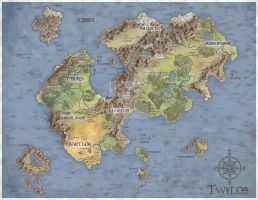 another map... this time, map of Undying Lands so guys... INTO THE WEST! This looks great. I am looking for someone to help me out drawing a map kinda like this. I absolutely love this, Amegusa! My sincerest compliments on this great peace of work. You managed to capture texture and contrast with a very limited colour palette. Very good! So cool ! I really love all the details and the destinations present here, totally awesome ! Awesome work. Unfortunately there is a lack of Aman maps in general. How'd you get it to look like parchment? Lovely map. I like the fonts and the 'old-fashioned' kind of look of it. I find it interesting to see where other people think places are located in Aman. I particularly like the mountains in this. They are very nice. Lovely map, and some interesting inclusions ...! That is amazing and beautiful! I especially love the ships and the detail on the mountains. So cool! Your a marvelous artist! Excellent map! Great details, lines, flags and so on. Is the text done with a font or by hand?